What’s New: At the Optical Fiber Communications (OFC) conference in San Diego this week, Intel’s Programmable Solutions Group is showcasing market-leading 58Gbps transceiver technology integrated on the Intel® Stratix® 10 TX FPGA — the world’s first field programmable gate array (FPGA) with 58Gbps PAM4 transceiver technology now shipping in volume production and enabling 400Gb Ethernet deployment. Why It’s Important: This industry-leading technology doubles transceiver bandwidth performance when compared to traditional solutions. It is critical for applications where high bandwidth is paramount, including: networking, cloud and 5G applications, optical transport networks, enterprise networking, cloud service providers, and 5G. By supporting dual-mode modulation, 58Gbps PAM4 and 30Gbps NRZ, new infrastructure can reach 58Gbps data rates while staying backward-compatible with existing network infrastructure. 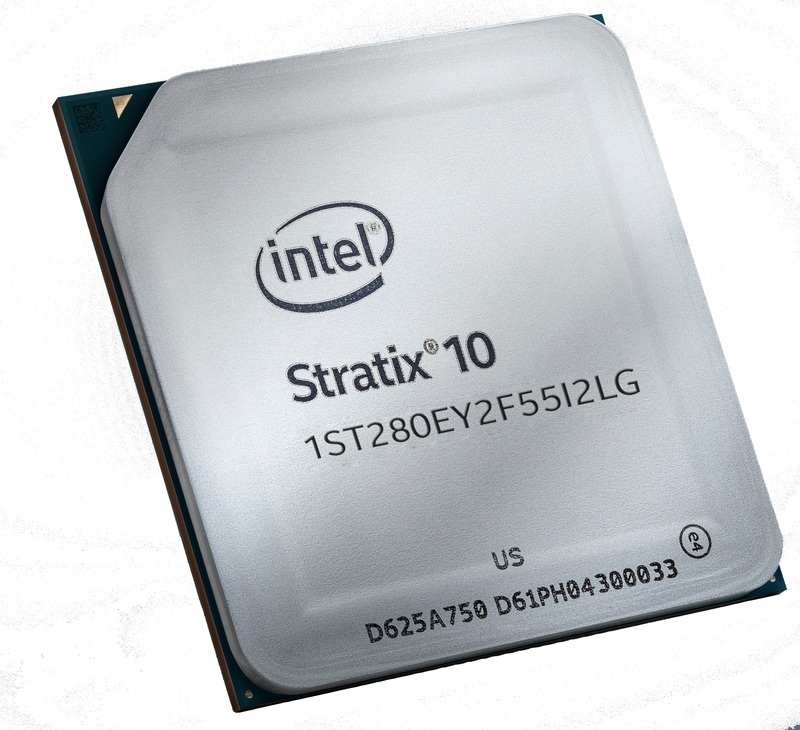 The Stratix 10 TX FPGA with 58Gbps PAM4 transceiver technology provides system architects with higher transceiver bandwidth and hardened IP to address the insatiable demand for faster and higher density connectivity. “The 400Gb Ethernet and QSFP-DD market is evolving at a fast pace. And being first to market with a portable solution is instrumental to enable the transition from lab to the field. We were excited to work closely with Intel to deliver our next-generation test module with the only production FPGA technology supporting native 58Gbps PAM4,” says Ildefonso M. Polo, vice president of Product Marketing at VeEX. What It Does: To facilitate the future of networking, Network Function Virtualization (NFV) and optical transport solutions, Intel Stratix 10 TX FPGAs provide up to 144 transceiver lanes with serial data rates of 1 to 58Gbps. This combination delivers a higher aggregate bandwidth than any current FPGA, enabling architects to scale to 100Gb, 200Gb and 400Gb delivery speeds. A wide range of hardened intellectual property cores, including 100Gb MAC and FEC, deliver optimized performance, latency and power. 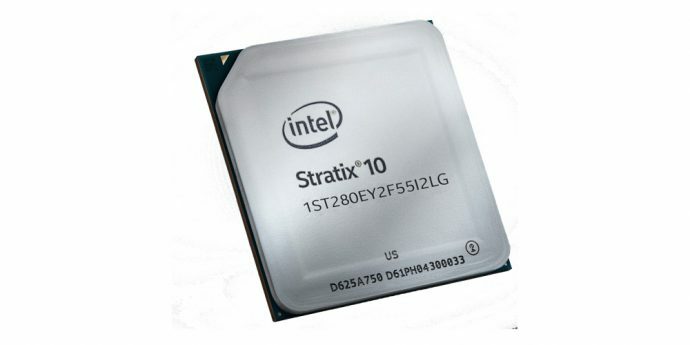 What It Delivers: Intel Stratix 10 FPGA 58Gbs transceivers are interoperable with 400G Ethernet FPGAs, using only eight channels to support new high-bandwidth requirements for routers, switches, active optical cables and direct attach cables, interconnects, and test and measurement equipment. What the Future Holds: At Intel Architecture Day, Intel unveiled a 112G PAM4 high-speed transceiver test chip built on 10nm process technology. The chip will be incorporated into Intel’s next-generation FPGA product families, supporting the most demanding bandwidth requirements in next-generation data center, enterprise and networking environments. The Small Print: Intel technologies’ features and benefits depend on system configuration and may require enabled hardware, software or service activation. Performance varies depending on system configuration. 28G is considered a traditional solution. Intel product can achieve over 57Gbps. No computer system can be absolutely secure. Check with your system manufacturer or retailer, or learn more at intel.com. Intel (NASDAQ: INTC) ist ein führendes Unternehmen in der Halbleiterindustrie. Mit Hilfe von Computer- und Kommunikationstechnologien, die die Basis weltweiter Innovationen bilden, gestaltet Intel eine datenzentrierte Zukunft. Intels Know-how trägt dazu bei, die großen Herausforderungen der Welt zu meistern und Milliarden von Geräten sowie die Infrastruktur der intelligenten, vernetzten Welt zu schützen, weiterzuentwickeln und zu verbinden – von der Cloud über das Netzwerk bis hin zu allem, was dazwischen liegt. Weitere Informationen über Intel finden Sie unter intel.de/newsroom and intel.de.